Home / Archive by category "Antiques Diva"
As I transform my Venice apartment into a home, I take pleasure in the process of unpacking the pieces I’ve collected and arranging (and re-arranging!) them into tableaus that please my eye. The French art of mise en scène – putting things in place – to give my home the ambiance and personality that I want to project. For guests of course, but I honestly arrange my collections for myself. What is your definition of home? I’ve been thinking a lot about what makes a house a home… for me it’s a space filled with people and laughter in the air. Fabulous smells coming from the kitchen, open bottles of wine and champagne always on tap. It’s antiques and family heirlooms, next to flea market finds and objet d’art, and the odd pieces of Ikea. It’s window boxes and shutters and flowers in every room and candles alongside cozy places to read. A real home is a mix of high and low… beautifully choreographed moments for a life well lived. I’m a natural collector. But how does one start a collection? Today my favorite dandy (j’adore being called The Dandy and The Diva! ), Gary Inman is sharing with us his expert advice on the art of collecting. Don’t miss Gary’s favorite books on the art of collecting! 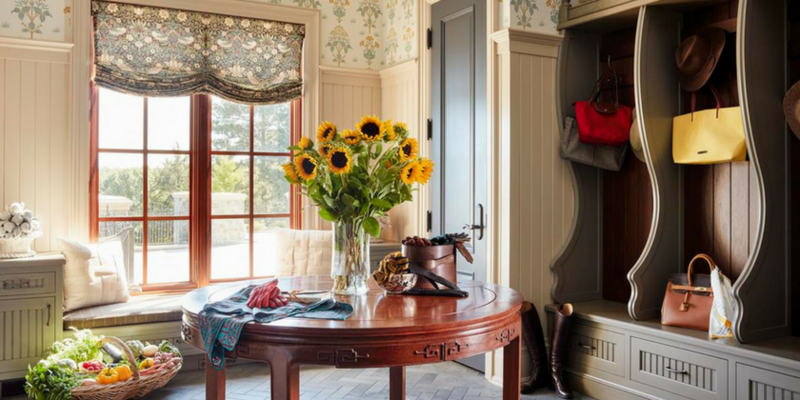 Featured image: William Morris textiles and wallpaper set the tone for this Virginia mudroom. The table is an antique Chippendale inspired fretwork design. English tole, majolica, and French garden finials provide character to the space. The bespoke herringbone floor is by Waterworks. Everyone is a collector, some just don’t know it yet. After twenty-five years of designing and decorating luxury homes, I have had many clients insist that they’re not collectors, only to become impassioned collectors once they discover their genre. Helping them find their passion has been one of the most rewarding parts of my practice. If you think back to your childhood, you’ll surely recall something you collected with unbridled enthusiasm. It can be as simple as sea shells or baseball cards, but regardless of value, nothing surpasses the thrill of the chase! The objects amassed can be costly or free, academic or whimsical, and the collection can be as small as three objects or as massive as a museum. This New York home is filled with romantic and genre scene art. This grouping includes Maurice Prendergast, Moses Soyer, Maximilien Luce, and Pierre-Auguste Renoir. The gilded frames were made in Paris. The mahogany piano is a restored Steinway from the early twentieth-century. As an art historian, I have always admired the erudite collections amassed by legendary collectors such as Henry Francis Dupont, Isabella Stewart Gardner, Sir Richard Wallace, Albert Barnes, Richard Jenrette or Henry Clay Frick. Their mammoth collections are now available to the world at museums and historic buildings devoted to the conservation of their achievements. Some collectors become as famous at their curations which are significantly autobiographical. Gertrude Stein, Carolyne Roehm, Coco Chanel and my personal favorite, Sir John Soane are examples of this phenomenon. I encourage you to visit all the museums associated with these collectors. This home was designed for a serious collector of American fine furniture and folk art. The quilt is an 18th-century masterpiece from Baltimore and the secretary hails from Philadelphia. This project was for a dear friend and showcased her collection of Wedgewood basalt in a dramatic and colorful way. Robert Adam would have approved the use of sky blue behind these classical forms. So how do you become a collector? I suggest you begin by doing your homework. Read the books I’ve listed below, visit antique shops and shows, research various categories such as ceramics, silver, textiles, art, antiques, illustrations, the list is endless. Also, survey auction houses and online dealers and wait for the magic to happen. You will discover a passion that will bring you joy for a lifetime! Once you buy that first piece you’ll be hooked. In my opinion antiques are always appropriate, even in a boutique hotel. This is the Dunhill Hotel in Uptown Charlotte, NC. The owner requested a very “British” character which allowed me to use objects from around the world. No one loves collecting more than the Brits. The sideboard is a 19th-century Chinese design I purchased from Clubcu in High Point. This entrance vignette gave me a chance to indulge my passion for blue and white porcelain. I love mixing antique and modern, and high and low in these groupings. Add fresh roses for a punch of color and this becomes the perfect first impression. Barbara Milo Ohrbach, A Passion for Antiques. Clarkson Potter/Publishers, New York, 2004. Charlotte Gere and Marina Vaizey, Great Women Collectors. Philip Wilson Publishers in association with Harry N. Abrams, Inc., Publishers, New York, 1999. Caroline Clifton-Mogg, A Passion for Collecting. Bulfinch Press, Boston, 2002. Commissioned paintings can be central to an art collection. Lea Barksdale’s bold blue stripe leads the eye up the 3 level staircase. Erika Vaden (left) captured the spirit of Cy Twombly in this vibrant blue calligraphy inspired painting. Piranesi engravings, an old book press, bronze urns, and Spanish alabaster lamps give this library a very classical bearing. The ceiling ornamentation is a restoration of the original Tudor strapwork design based on photography. My first designer showhouse room, it was tapped for publication in Traditional Home. I just attended High Point Spring Market, a must-do on the interior design circuit, held twice yearly in High Point, NC. In addition to leading 4 events, I was an Instagram trend-spotter for High Point Market @HPMKT and a style spotter for The Chaise Lounge@thechaiselounge taking over their Instagram pages to share what I thought was Hot this Spring! 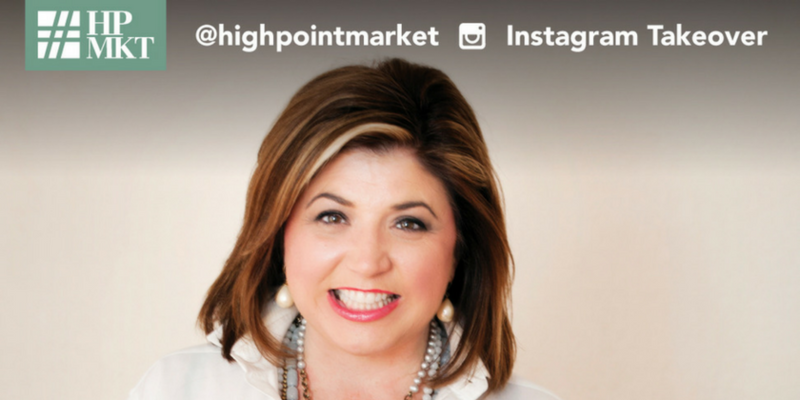 Before you read which vendors and products were the best of #HPMKT – Mark your calendars for this Fall 2018 when my furniture collection launches at High Point Market at Aidan Gray Home! One of my favorite product launches this #HPMKT is the mantel collection from @denisemcgaha with @materialsmarketing at @highlandhousefurniture showroom on 200 Steele #designingwithadeadline #antiquesdiva #dallasdesigner#highlandhouse #dmdesigns Super Chic! Don’t miss The Antiques Diva Early Bird Tour of The Antique & Design Center High Point Fall Market! I recently attended The Original Miami Beach Antique Show for the first time and was gobsmacked by the size of the show and the sheer number of antique dealers onsite! Diva heaven! In addition to leading a tour of the show, I teamed up with Nicole Sawyer and Dan Thieleman, the founders at Chattic, a new way to ‘value your old stuff,’ to lead a series of Facebook Lives for Chattic! I’m on a mission to make antiques modern and relevant to younger people: and I believe technology is key! I was super-excited to introduce this new technology at the show with some real-life appraisals of people’s collectibles – right in their own home! 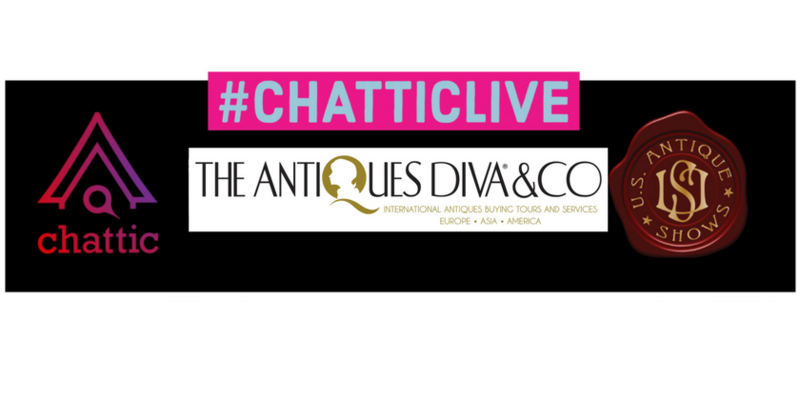 Just as Chattic believes The Antiques Diva® & Co is the new Antiques Roadshow, I’m convinced Chattic is the new way to value your old stuff. The IOS App is coming soon – Chattic invites you to be the first to beta test the app. Go to www.askchattic.com and enter your email address – tell them The Antiques Diva® sent you! 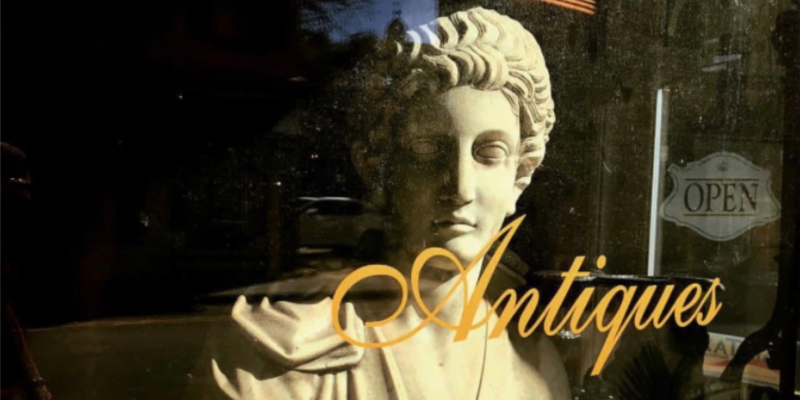 Chattic, The Antiques Diva and The Original Miami Beach Antique show announced are all on a mission to make collecting cool and bring the antiques and vintage industry into the 21st century. Chattic teamed up with legendary appraisers Stuart Slavid from Skinner Auctioneers who is also a regular expert on the PBS series The Antiques Roadshow, and Paul Haig founder of Haig’s of Rochester – Fine Jewelry & Objects of Art, to bring #ChatticLive; a digital TV show streamed on Facebook Live to provide viewers’ answers from experts on demand by simply sending in digital photos of their unique vintage and antique finds. This is the first time users have had the opportunity to interact in real time, for free, with world-renowned experts in the antiques industry without leaving the comfort of their homes. On Chattic, users can snap photos of their items and post them on the app for crowd-sourced feedback. WATCH The Antiques Diva challenge Stuart Slavid to a Burlesque dance-off and Chattic users get answers simply by snapping photos of their unique items. During #ChatticLive Stuart gave users actionable tips on posting photos for online appraisals. Look at the picture yourself make sure you can see whatever information you want to portray. Don’t just send one picture, take several from every angle. Snap photos of the top, bottom, sides, front, back. Vague photos mean a much longer conversation than need be. Elaborate on the condition, dimensions, and take close-up photos of signatures or any distinguishing marks. Take a photograph of your piece next to something standard like a soda can or cell phone to give the appraiser an idea of relative size. Chattic user Amy from Indiana learned her two vases were actually Chinese Republic porcelain, roughly 100 years old with a value of $800-$1200! Congrats to Amy! Chattic user Halina from Florida sent photos of a unique piece of jewelry that her father-in-law found in a New York City cab in the 1950’s. For the first time in nearly 70 years, she finally got answers on this mysterious treasure. 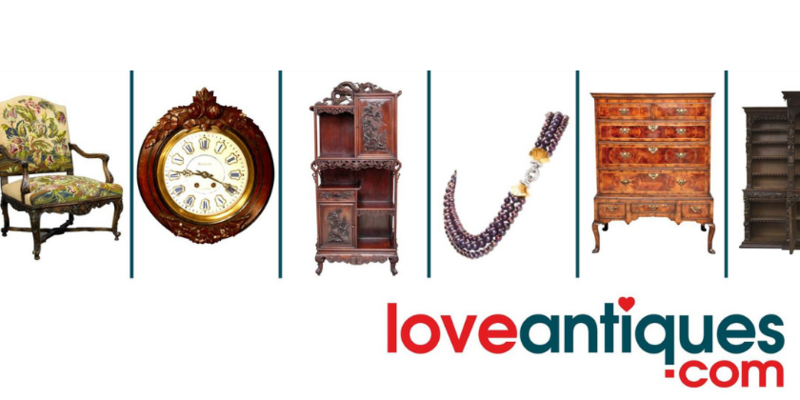 How do you think technology can be used to keep antiques relevant to younger buyers – I’d love to hear your ideas! January 21, 2018, The Antiques Diva & Co celebrated our 10 year anniversary at our annual Paris Flea Market Champagne Brunch. Attended by hundreds of design professionals during Paris Design Week, we started the New Year with a fabulous 10th anniversary event organized by my publicist Andrew Joseph PR, the Paul Bert Serpette Marché and our dynamic team of Antiques Diva Guides who welcomed our guests and provided mini-tours of les Marchės Aux Puces after and during the fête. Professional photography by Joachim Frydman. Here is a peek at the festivities – try and join us in person next year! We always hold our fête on the last Sunday of Déco Off, first Sunday of Maison & Objet at the Paris Flea Market! The brunch was held at Antiquitiés Rodriguez Décoration, a stunning antiques store filled with of antique furniture, decorative objects, art, architectural salvage and curiosities at 15 rue Jules Vallès. One of the largest – if not the largest – shops, it was an ideal setting for a party with our VIP interior designer guests; Deborah Lalaudiere and her team welcomed us to their store and so we could browse and shop while we sipped cocktails and coffee. Visit their shop at the Paris Flea Market or on 1st Dibs – you won’t be disappointed! Our 10th Anniversary Champagne Brunch was co-hosted by Traditional Home Magazine, and our panel discussion was led by Krissa Rossbund, Senior Style Editor at Traditional Home. Expert panelists Randal Weeks, CEO of Aidan Gray Home; Melissa Mittag, National Sales Director of Fromental; and I answered Krissa’s questions on How Antiques Influence the Future of Design. Un gros merci to our sponsor CITADELLE GIN for whipping up French 75s using our Antiques Diva champagne, Citadelle Gin and a splash of lemon and simple syrup! Alex Gabriel and Paris Antiques Diva Guide Debbie Gabriel (below) are the owners of Maison Ferrand, makers of Citadelle Gin. Watch me learning how to make a French 75 cocktail here with bartender Cedric. Guests at the party were able to get a sneak peek of a few of my furniture designs for the upcoming Antiques Diva Collection by Aidan Gray. As the fête was held during cocktail week in Paris, it was only appropriate that we had author Doni Belau of Girl’s Guide to Paris in the house signing her book Cocktails in Paris! 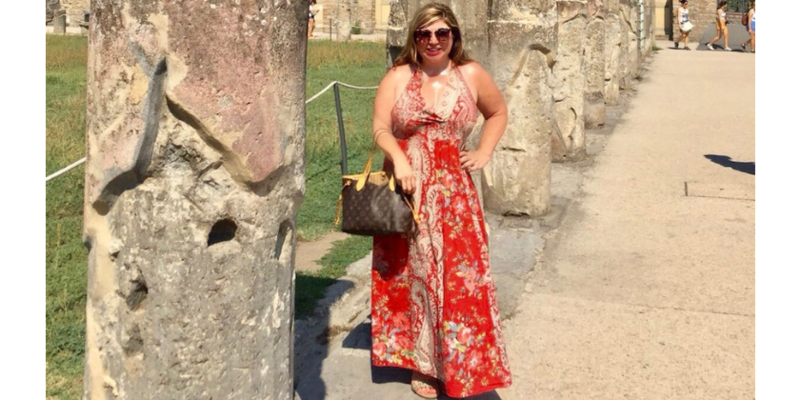 Doni is also one of our US Antiques Diva Guides. Keeping up the cocktail theme, we were delighted that root cellar designs was one of our 10th Anniversary Paris Flea Market Champagne Brunch sponsors, contributing cocktail napkins from their fabric collection to our Gift Bag. Merci, Tamara Matthews Stephenson! More behind the scenes photos are in our photo album. 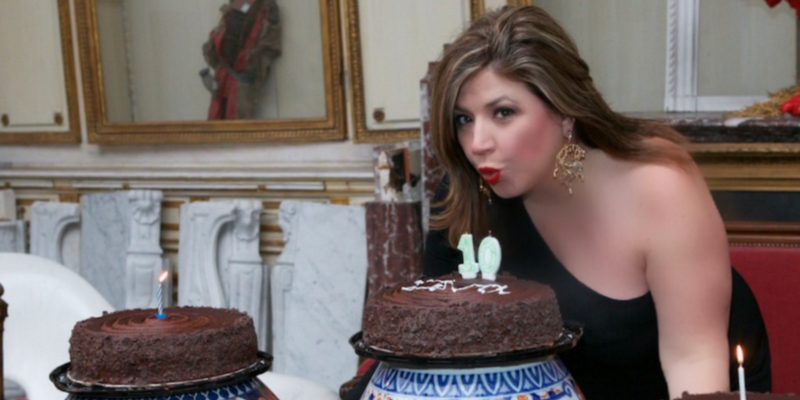 We’ll be celebrating The Antiques Diva’s 10th anniversary at events throughout the year – and setting the date for next year’s Paris Flea Market Champagne Brunch soon #WatchThisSpace! 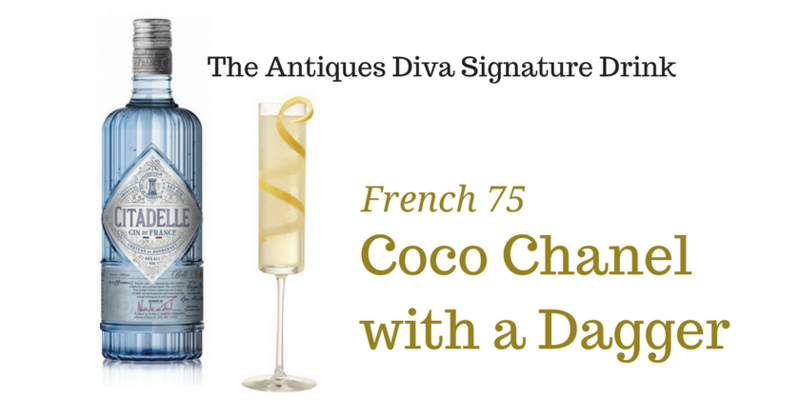 Artisanal Gin de France producer Citadelle Gin, by Maison Ferrand, will make French 75s – my signature cocktail that I like to call Coco Chanel with a Dagger – with The Antiques Diva signature champagne. Not only is Citadelle my favorite gin, Maison Ferrand happens to be owned by Alexandre and Debbie Gabriel, one of our Paris Antiques Diva Guides. Citadelle Gin is made following a centuries-old method, using an open flame pot still distillation, and a traditional Charentaise pot still used in Cognac, France. Distillation over an open flame allows the complementary aromas to come together when the wine comes into contact with the bottom of the boiler. The name Citadelle honors where this gin was first authorized to be made in 1775 by Louis XVI, at the Citadelle in Dunkirk. I’m delighted to introduce our new Amsterdam Antiques Diva Guide, Mariska Meijers. Mariska is not just a Diva Guide but a Dutch icon in her own right. She’s a fellow #GirlBoss and when I’m having a bad day she’s the one I call to say “Shoot Me Now”. Then – of course – she convinces me not to jump from that ledge! For those of you who are following me on my journey as I launch a new brand – the TCH Collection – Lush Decadence Couture Jewelry line – Mariska will also be our Amsterdam distributor for the collection. And will be participating in our TCH Collection pop-up shop in Paris this Jan 17 – March 18, 2018, at Galerie Vauclair. She’ll not only provide one of her signature custom-made kimonos for me to wear to the Vernissage January 19, but she’ll also have a special edition Diva Line of pillows for sale! What makes them Diva? Accessories of course? Anyone who knows me, knows I have a penchant for feathers, furs, glitter and more… and Mariska captures that personality in pillow form! 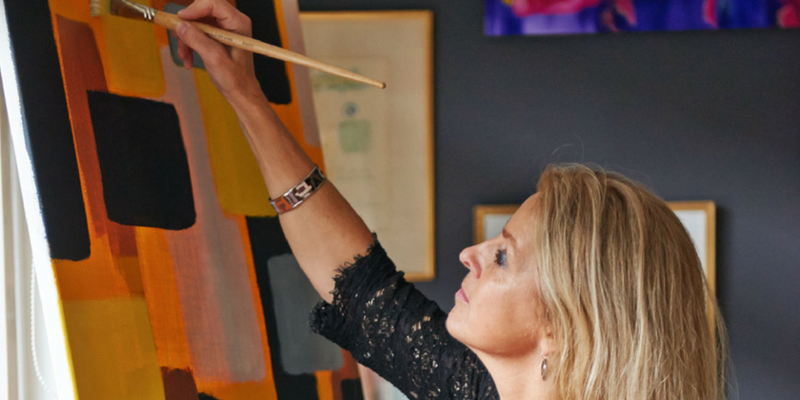 Mariska Meijers is a Dutch artist and designer, renowned for her signature vibrant colors and bold patterns. Based in Amsterdam, Mariska moved back home to Holland 15 years ago, after having lived and worked across Europe and Asia. She is an avid traveler and collector – and both inform her eye. She loves to share her hometown with visitors and introduce them to her local sources and contacts. She has grown her art and design studio into a global lifestyle brand sold through luxury department stores and small boutiques in over 30 countries. Her store/design studio in the historic city centre of Amsterdam is a hidden gem, located in the basement of a 17th century canal house on Keizersgracht 158 is filled with her own collections and art combined with original finds from all over the world, including art, antiques, vintage, lighting, jewelry and much more. Mariska’s work has been featured in traditional and online media, including VOGUE.COM, The World of Interiors, Architectural Digest, Homes & Gardens, House & Garden, Marie Claire Maison, Domino, ELLE Decoration, ELLE DECOR, Living and others. Antiekcentrum Amsterdam: a real treasure trove with over 55 dealers. Noordermarkt: an outdoor market only on Saturday and Monday. Gezusters Stoop Lampshade Workshop: I have a strong love for vintage and antique lighting. This tiny store and shade atelier has a great selection and if they don’t have it, the owner Carin will source it for you. They can also build a lamp from any object you bring in and custom make a shade for it. Toscanini: brilliant authentic Italian food – but you have to book weeks in advance. In winter, Rijkmuseum as it is absolutely beautiful and inspiring. Cut the lines by booking online. Alternatively, visit either Cromhout Huis (styled by the talented people of Wunderkammer Webshop) or Willet-Holthuysen Museum, both beautifully preserved 17th centre canal houses. I personally invite you to book an Antiques Diva Amsterdam tour with Mariska and discover her Amsterdam for yourself! My good friend Gary Inman (we’re known as The Diva and The Dandy!) is one of the most renowned hospitality designers in the industry – He is an award-winning designer, author, and professional speaker whose work has been published in Veranda, House Beautiful, Elle Decor, The Washington Post, Southern Accents, Traditional Home, Hotel Design, Home & Design and many others. I asked for his expert advice on creating a sense of place! This is the way great designers think about crafting the local and authentic experience. 1. Great Design Begins with a Great Story! Every unique place on the globe has a unique story that only they can tell. Hotels and Resorts are our homes in those locations and they can, and must, enrich the sense of place. As designers we weave a narrative of tangible and intangible references to the history of place. A great story tantalizes all the senses. Research is the foundation……designers must do their homework! 2. Fragrance is the most powerful force in evoking memories and forging new memories. The spice markets of Istanbul, the flower markets of Amsterdam, the scent of fresh pines at Pinehurst, or the intoxicating aroma of the sea and agave in San Juan Capistrano. Remember the smells from your grandmother’s kitchen… fragrance transports us back to places that have touched us. 3. Art can convey the story of place in the most obvious and powerful ways. We use local artists and craftspeople to create artwork, lighting, unique case goods, textiles, gardens. “Local and authentic”, a phrase coined for Hilton’s Curio brand, is the mantra of all sophisticated travelers today. One of the most provocative ways to celebrate place is to set up views from rooftops, elevated rooms, spas, and restaurants. Engaging visitors with a spectacular view will connect them emotionally to place. Dining with a view of the Acropolis in Athens, or atop a skyscraper in New York or with views of the bay in San Francisco. Many of the places we visit have singularly unique views in the hands of a skilled architect and designer. 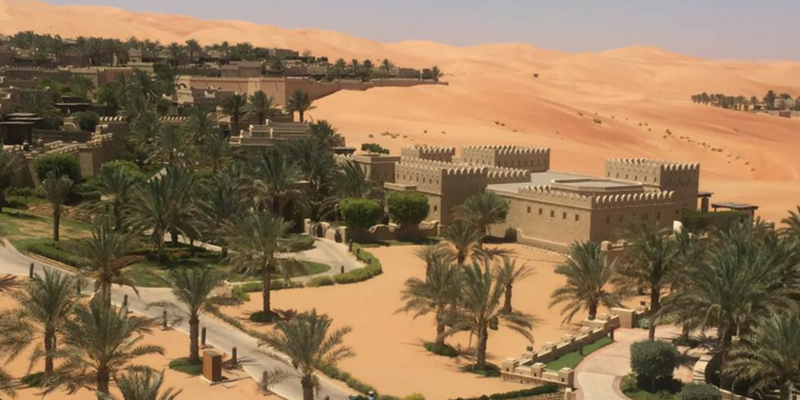 Luxury travel is impossible without impeccable, non-obtrusive service. Many of the best stories for the local culture come to us from the staff at hotels and resorts. Many have spent their lives immersed in the culture and history of the location. I never fail to ask for advice from the hotel team, they can be a great treasure trove of stories. Brilliant, n’est-ce pas? For more design inspiration, follow Gary online. I’ve asked Gary to become a regular contributor to The Antiques Diva blog – I’m looking forward to his next post!